My wife and I just celebrated our 4 year anniversary at Nobu. Originally I tried to get us reservations at the Malibu Nobu because the views are breathtaking. Unfortunately, they were closed on our anniversary due to a private event for July 4th weekend. Determined to make good on my promise, we booked a reservation at the Nobu in Los Angeles, CA. 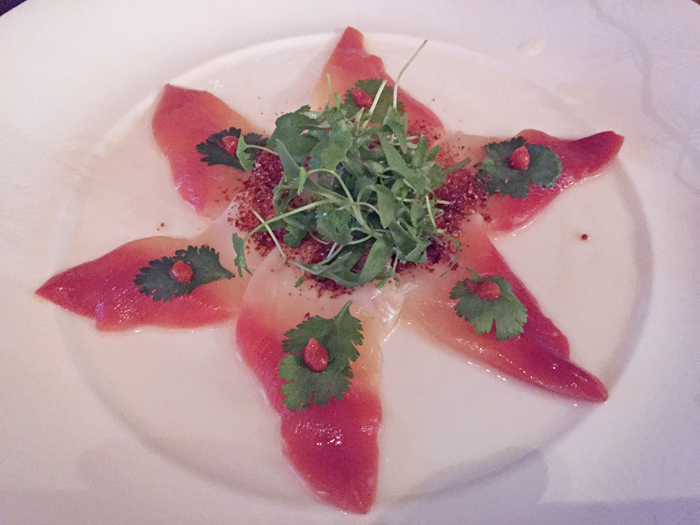 Join us on our experience of a personally crafted ten course meal from Chef Nobuyuki Matsuhisa! Our entire meal was amazing, but since the prices are not so wallet friendly, I will lay out which dishes are worth their weight in gold. 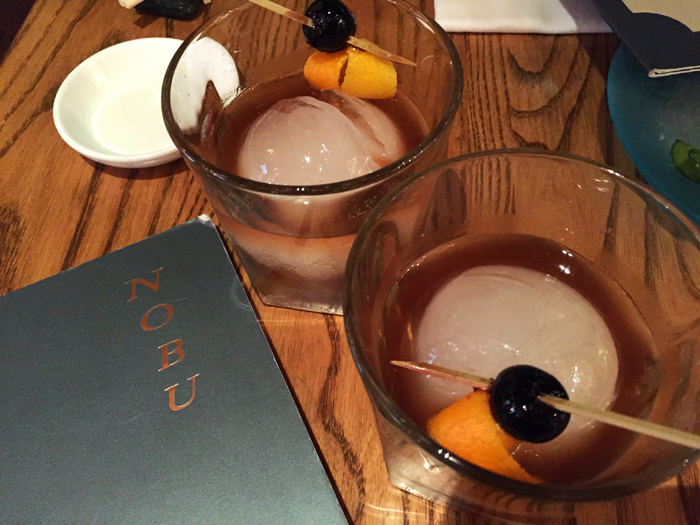 To start off our Nobu review, I want to tell you about their Hakushu old fashion shown above is definitely a winner in my eyes ($16). 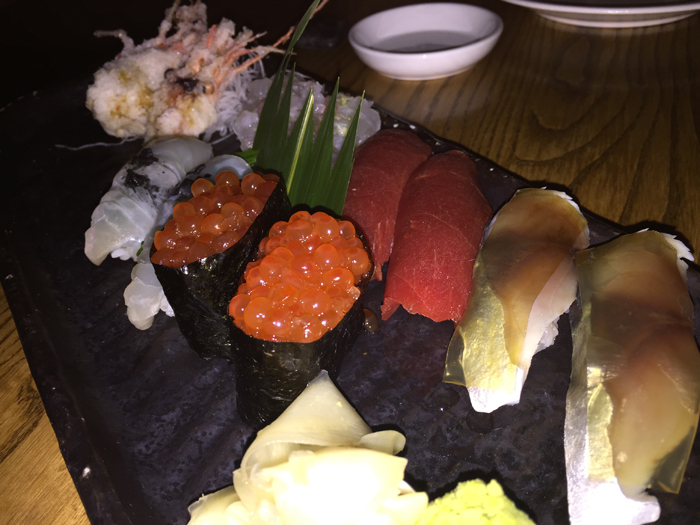 When you eat at Nobu, you have a choice of ordering a la carte or you can choose to order Omakase style, which is basically leaving the meal in the hands of the Chef. Our first course was Live Octopus Shabu Shabu ($27). I was pleasantly surprised because normally I am not a huge fan of octopus, but their octopus was so tender and the two sauces they had was amazing. I am not sure why the dish is named Live Octopus Shabu Shabu because it is not served live nor was it Shabu Shabu. However, I consider it a great octopus sashimi dish. The red sauce was a traditional chili sauce but their green one was an oil based mint sauce. By itself, the mint sauce was not all that great but when you dip the octopus into the chili sauce, then dip it into the mint sauce it was amazing. I highly recommend this dish for the experience, just do not order it expecting to get full off this dish. 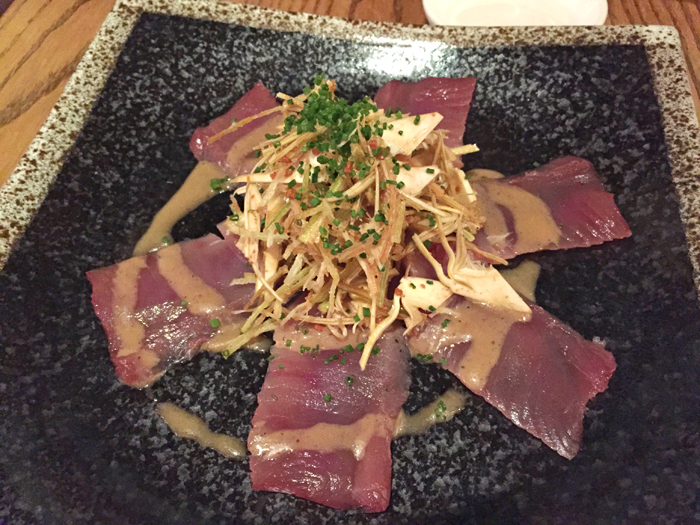 Our second course was Hagatsuo (baby bonito) served with fried artichoke heart ($29). This fish has a decent amount of flavor, so it went really well with the fried artichoke heart. When eating the fish with the artichoke, it creates a combination of great taste and complex texture in your mouth because you have the crispy artichoke mixed in with the silky fish and sauce. Although I enjoyed this dish, bang-for-your-buck, I am on the fence with this one because the other dishes knocked my socks off. 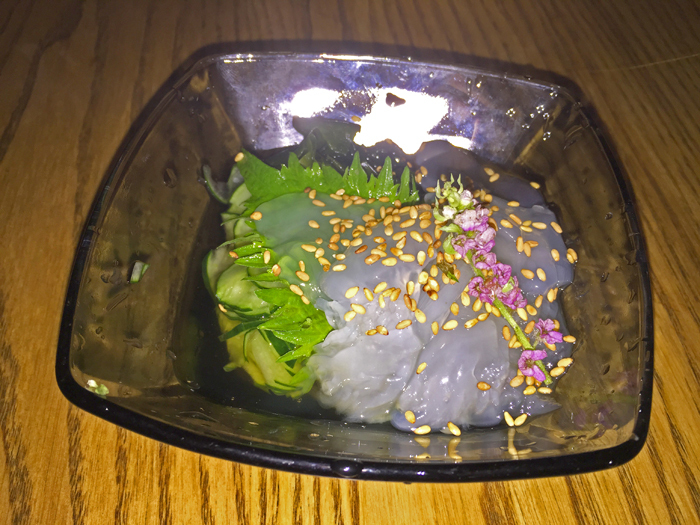 Course number three for us was Kurage (Jellyfish) Sashimi ($20). Let me first start off by saying I am not a big fan of jellyfish. With that being said, this dish was amazing! 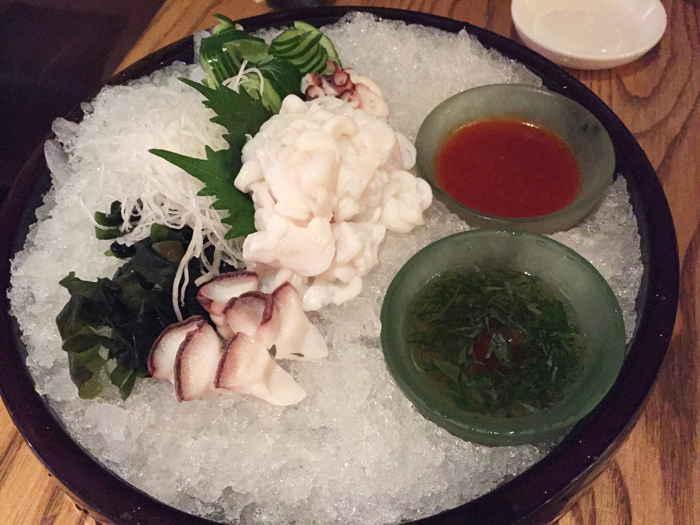 It has a refreshing sweet and sour flavor and the jellyfish was ridiculously tender. Sara talked up this dish but was not over selling it at all. I highly recommend this dish if you like sashimi. 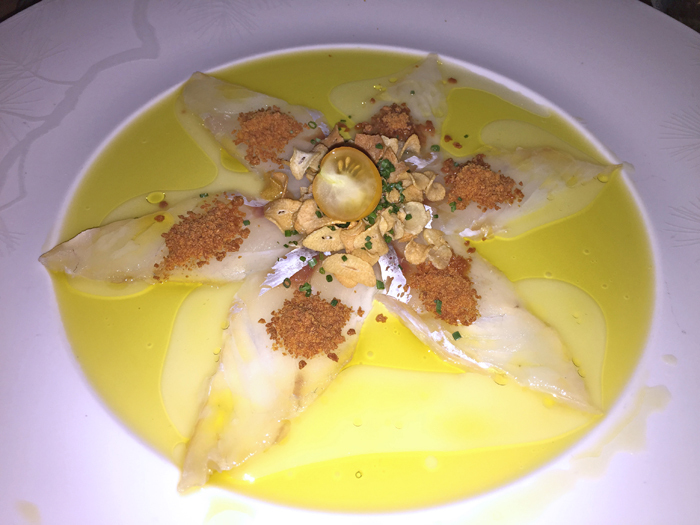 Our fourth course was Hokkigai (Surf Clams) Tiradito ($30). This was another great dish built around complex flavors and textures. Personally, I am not a huge fan of micro greens, but when you mix the micro greens with the clam, cilantro and chili sauce it creates a perfect balance of flavor. At first, my wife ate the clam without the micro greens and she immediately thought the cilantro was overpowering. The second time she tried it with the micro greens which allowed the cilantro to become a simple background flavor that played well with the other ingredients. If I had to put this dish up against the Hagatsuo served with fried artichoke heart, I would choose this dish. For our fifth course, Sara served us Crab and Wagu Tacos ($7/each). 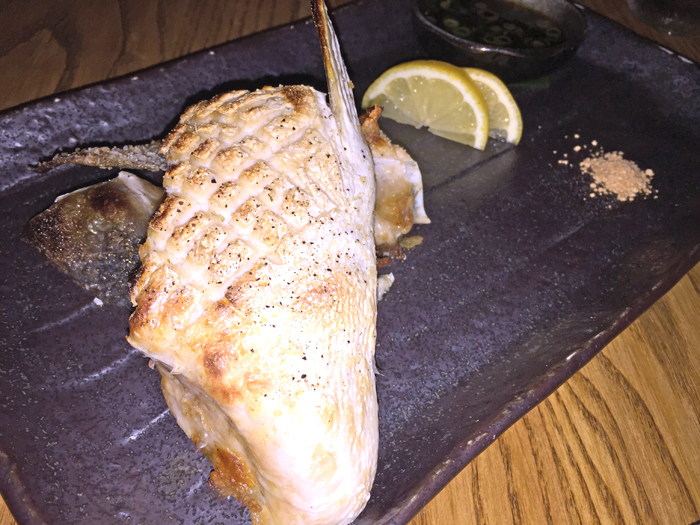 Hands down, a must have at Nobu! I never thought I would eat a “high end” taco, but this dish blew my mind. 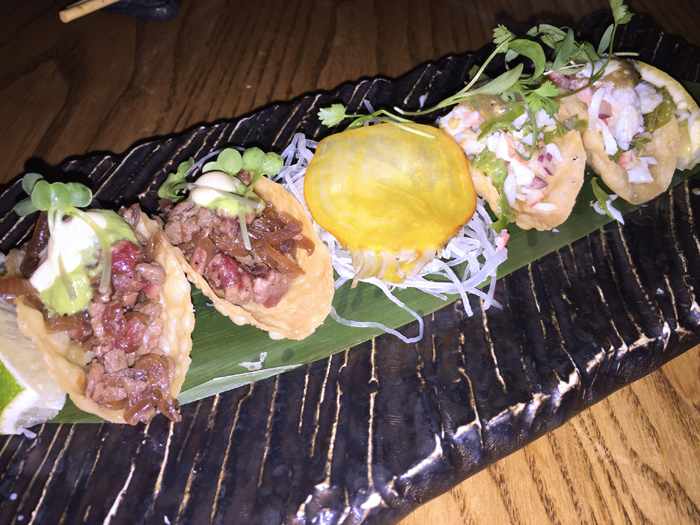 I do not think I can stress about how amazing these little bite size tacos are, so just make sure you try them if you go to Nobu. Their Wagu taco was an explosion of flavor paired with the most tender beef I have ever experienced in a taco. I am talking about the kind of flavor where the minute the taco hits your mouth, your eyes close and all the noise becomes non existent as you slowly chew while hoping the flavor never leaves your mouth. Having a crab taco as a chaser is a great idea because the crab taco is a more light and refreshing bite compared to the fatty Wagu beef. Both tacos are must try in my opinion, but the next time I go to Nobu I will probably order two Wagu Tacos and one Crab Taco for myself. Our sixth course was Magochi (White Fish) with Dry Miso ($33). My wife really liked this dish, but I was not in love with it. Being a white fish, the flavor of the fish itself was subtle so the flavors that you taste are from the dry miso sauce and the fried garlic bits. My wife really liked the texture and crunch of the garlic bits, but I thought they overpowered the fish to the point where all I tasted was the garlic. It was a good dish, but not one that I personally would order again. If you like white fish and garlic though, then you should try this dish. Course seven was a traditional Hamachi Kama (Yellowtail Collar) Miso Salt ($18). If you have had Yellowtail collar before then you know you can not go wrong with this dish. They have a great Ponzu sauce and the amount of fish you get is actually a generous portion for a fine dinning restaurant. If you plan on ordering a bunch of small plates just for taste, then this is a great dish to help fill you up for the night. Our eighth course was Kurobuta Pork Belly ($20). 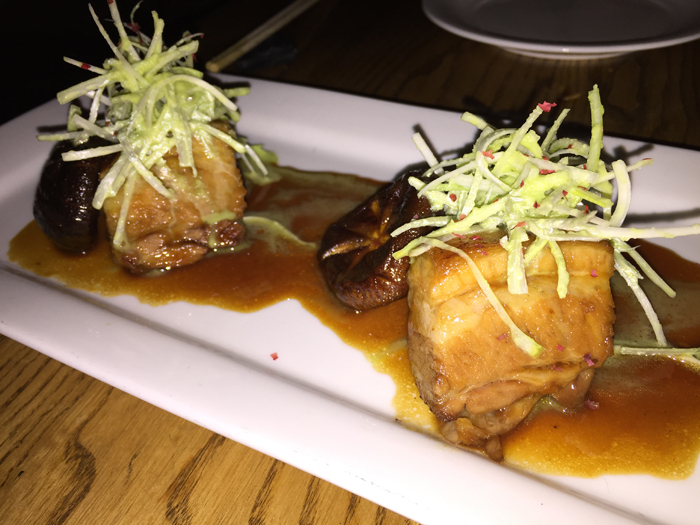 Personally, this was my favorite dish because I am a huge fan of pork belly when it is done right and Nobu does it right! 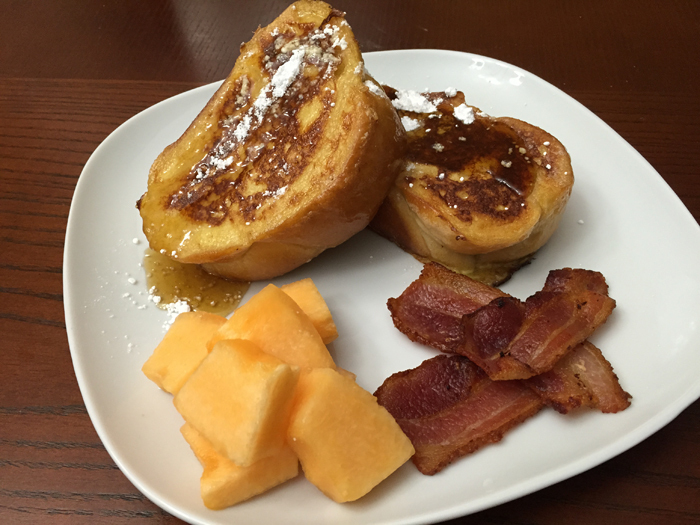 I am talking about melt in your mouth tender with a sweet sauce. The leeks added a nice texture as well as a subtle grassy flavor that helped to balance the fatty pork belly. For most people I would put the tacos above the pork belly, but for me they are neck to neck. Course nine for us was the Lobster Wasabi ($45). I have mixed feelings about this dish because I love lobster but I did not feel it was necessary to have this dish as part of our course menu (especially after the Yellowtail collar). 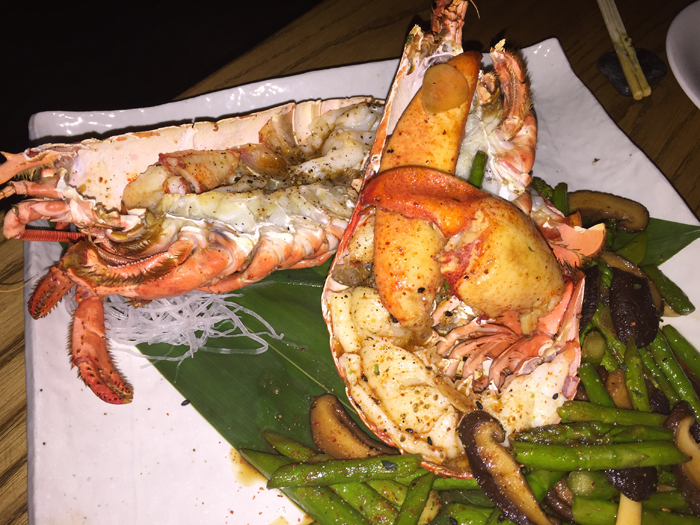 Nobu makes a great lobster and I really liked the amount of lobster you get with the green beans and shiitake mushrooms. I guess I would have rather preferred a lighter dish that focused on intense flavor. However, if I was not doing a multi-course dinner then I would recommend ordering this dish as a main course because it was amazing and quite filling. Our tenth and final course was Japanese Snapper, Sweet Shrimp, Blue Fin Tuna, Mackerel and Salmon Roe Sushi ($45). 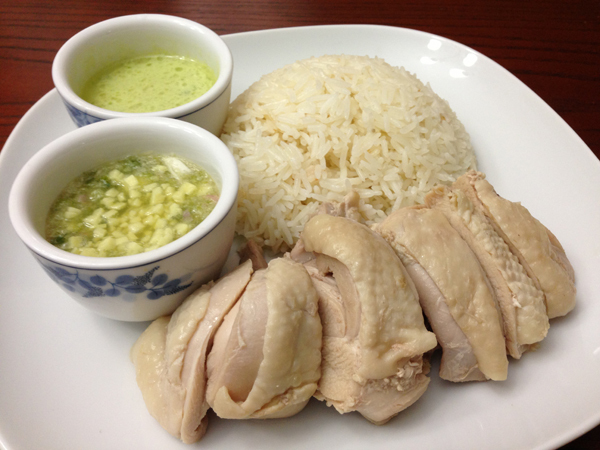 To be perfectly honest, this was my least favorite dish and not because it was the last dish. I did enjoy the sweet shrimp sushi, but other then that I was not really blown away by the other pieces of sushi. The quality of the fish was good, but nothing spectacular. Bang-for-your-buck, I personally would not order “sushi” at Nobu because I think their non-sushi dishes are where they shine the best. My overall feeling after conducting this Nobu review is they offers a great experience but at a high price. Overall the meal was great and I really enjoyed the experience of not knowing what we were going to eat. However, if I were to treat Nobu as a non-anniversary restaurant, I definitely would have spent less money and hand picked the items a la carte style. Now that I have tried 10 of their dishes, I know which ones I will go back for. Hopefully you were able to find some dishes that you might want to try as well.